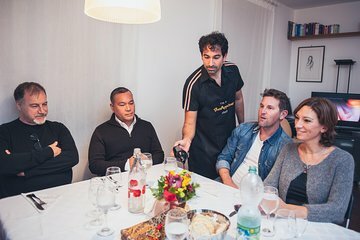 Disfrute de una cena gourmet en la casa de un chef romano local durante esta excursión nocturna en Roma. 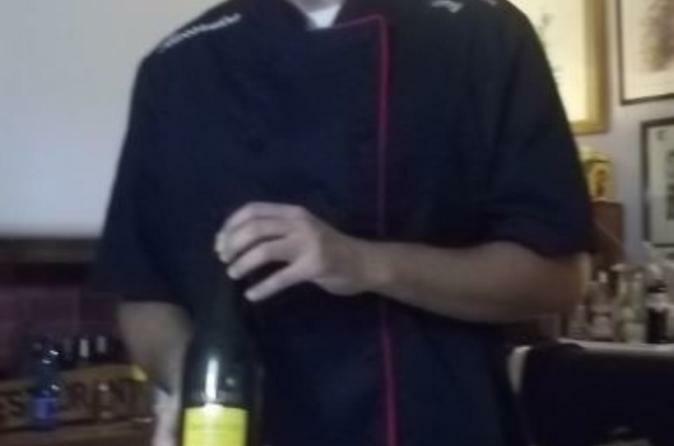 Conozca a Alessandro, un chef y sommelier, en su apartamento para una comida de 4 platos con maridajes de vino y tal vez un poco de limoncello casero (en temporada). Con su pequeño grupo de compañeros amantes de la comida, comparta una mesa y hable sobre viajes, comida, cine y libros. Reciba consejos de sus anfitriones locales sobre las atracciones y restaurantes fuera de los senderos de Roma y disfrute de esta experiencia íntima, única y deliciosa. Conozca a Alessandro, un chef y sommelier, en su apartamento para una comida de 4 platos con maridajes. Con su pequeño grupo de compañeros amantes de la comida, comparta una mesa y hable sobre viajes, comida, cine y libros. Disfruta de esta experiencia íntima, única y deliciosa. Nice cook, wine not impressive and no selection, other than white or red from the same vineyard. Food was just ok. The host was very nice. The idea for the evening very interesting. The food was just ok and there was no wine tastings as I thought there would be in a sommelier's home. This was a highlight of our Italian trip. The food was excellent and beautifully presented in the home of our chef. His partner was delightful and the evening was a delight. Alessandro was great! It was fun to have dinner in a traditional home and talk to a local! This host and his wife were wonderful. So warm and sincere. The host was extremely enthusiastic about what he did and you could tell how much he loved entertaining, food and wine. He was knowledgeable and even with the language challenge he did his best to really educate us about the wine and food he was serving. There were 7 people at the table and it made for good conversation. I give it 4 stars only because the food was a little disappointing for me. I was there alone, but there was a group of 4 women traveling together, one was their mother and she had diet restrictions so our host had to cater to her restrictions which made the food bland to me, that is the reason it was a little disappointing to me. I was really looking forward to some very tasty and spicy Italian cuisine. Ett härligt sätt att träffa andra människor och ett bra sätt att få tips från en lokalbo. Alessandro was charming and knowledgeable. The food and white wines were great but the red wine mearly passable. Between our group of four and second group of four, Alessandro was too busy cooking and serving to sit with us nor share any insights about wining and dining in Rome. We was good enough to send an email with some info the next day. All in a all, a pleasant experience. This was a great experience with Alessandro. Dinner was excellent and informative. A great way to enjoy a meal and culture in Rome. I would do it again. It was fantastic to eat in the home of a chef. The food was fabulous. Allesandro and his wife were great hosts. They were very friendly and they went out of their way to make the night great - including allowing us to choose the menu from a wide variety of choices, picking an easy meeting point, and even walking us to the bus stop after the meal to make sure we were able to get back to our hotel.